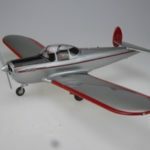 At Custom Models our master craftsmen can build you a model airplane, model helicopter, model ship, model yacht, model boat, model car and even a model spacecraft! Our models are custom made, personalized and of the highest quality and meticulous to the last detail to include markings and registration numbers. Your specifications will be our blue print, and this applies both to the model and the stand. These models are made of solid renewable mahogany, and are hand painted giving a realistic and exact finish. Our in-house aviation historian and our extensive database ensures that your model is well researched, and all we require from you is some photos and your specifications. 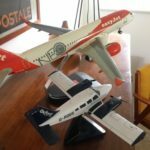 We can scale your model to any size you would like. We endeavour to have photos for approval of your model within 14 weeks, we aim to please and only on your approval do we finalize the last coat of varnish and arrange shipment. We are happy to ship anywhere in the world. Wow. The model is gorgeous, absolutely amazing. You did absolutely all the corrections I have asked for, and even more: cockpit detailing looks unbelievable, flaps and slats have been improved in smaller details (I love the look of the new flaps a lot). So, no more changes nor alternations. I have picked up the model today and it is brilliant. My second model arrived today & It’s breath taking. 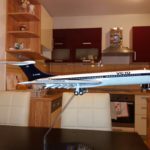 My fokker 100 is ace. Words can hardly express my gratitude for the Canberra. My only complaint is that I can hardly take my eyes off it. Each time I notice another detail and can hardly image the research and work which went into the making of it. I shall treasure it always.